“[Virtual reality] is the frothiest space in the Valley right now. Nobody understands it but everyone wants in. Any idiot could walk into a f***ing room, utter the letters ‘V’ and ‘R’, and VCs would hurl bricks of cash at them." Virtual reality (VR) and augmented reality (AR) are clearly the talk of the tech world, at least according to (fictional) entrepreneur-turned-incubator-manager Erlich Bachman in the latest episode of HBO's hit show "Silicon Valley." But does the data back him up? We decided to do a deep dive on the industries, providing a full gamut of datasets on investment trends, standout companies, notable exits, the most active firms in the space and much more. We also spoke with investment professionals at Madrona Ventures and ff Venture Capital to get their outlooks on the industry. Scroll down to check out everything you need to know about VC activity in the up-and-coming VR/AR space. While the VR and AR industries have recently been thrust into the spotlight, the ideas behind the technologies have been around for decades. Numerous companies have released products designed to transport users into new or augmented worlds, with traces of the tech popping up as early as the 1950s. The Sensorama Machine, for example, was invented in 1957 as a way to simulate various real-world experiences—such as riding a motorcycle—by having a viewer sit on vibrating chair while watching a movie through a viewer. More recently, Sega showcased an in-development VR headset at Winter CES in 1993, with hopes of releasing both an arcade version and a home-use console. At the end of the day, the product never made it past a prototype and wasn't released to the general public—which the company blamed on the experience being "too realistic". Yet the past few years have brought an inflection point, with companies such as Facebook, Microsoft and HTC all devoting entire teams to making these long-sought-after technologies a reality and VC investors chomping at the bit to back—and hopefully cash-in on—what some are touting as the next mainstream computing platform. Facebook especially has made a strong push for the popularization of both technologies, via its Oculus acquisition in 2014 and the recent launch of an AR camera effects developer platform. Although the VR/AR industry garners a good amount of media attention, annual venture investment in the space is more modest than you may have been led to believe. Since the beginning of 2010, investors have disbursed about $4.5 billion via 1,179 venture deals around the world to 707 different startups operating in the space. The first figure is somewhat inflated, however, by the presence Magic Leap, which has secured over $1 billion in funding, nearly a quarter of the industry's total. When its massive rounds are taken out, annual capital invested shows a more gradual increase, peaking last year with $1.15 billion invested through 361 rounds. So, although total numbers may not wow some—especially when compared to industries like SaaS or fintech—venture investment in VR/AR is trending upward YoY. The annual rate of increase in investment may be about to change, however. Many tech giants have recently come out in support of VR/AR, most notably Facebook, with the launch of its aforementioned AR platform. With more and more attention coming to the industry from established players in the tech space, it wouldn't be a surprise to see VCs again make a record amount of bets on VR/AR this year, perhaps at an even higher clip than we've previously seen. Annual deal count figures are increasing at a faster rate than capital invested, a trend that can be explained in part by digging into the types of rounds being completed each year. Seed deals have made up the majority of completed rounds every year of the past half-decade, which makes sense considering the smaller check sizes required for such investments and the relative immaturity of most VR/AR businesses. And their share of the pie is if anything growing: seed rounds made up 59% of all rounds in the VR/AR space in 2013 and 65% last year. Compare that to the more-established SaaS industry, in which just 37% of all rounds in 2016 were of the seed variety, and it becomes apparent VR/AR is still in its infancy. 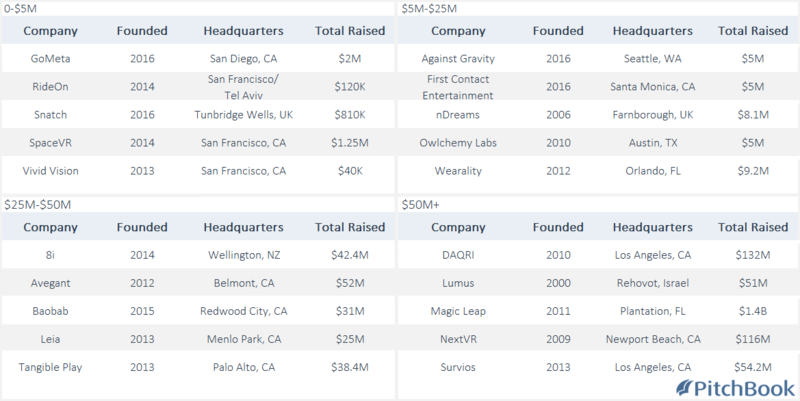 While the vast majority of rounds for VR/AR startups are concentrated in the early stages, a handful of companies have raised more-sizeable amounts of venture funding. Magic Leap, for example, has secured roughly $1.4 billion in total funding since its founding in 2011. The Florida-based industry giant is a bit of an outlier, though, and there's a pretty stark drop to Blippar and DAQRI, the next-most-funded companies in the space. One of the PitchBook Plaftorm's features is Signals, which tracks a company’s Twitter followers, Facebook likes, and referring links. Through this tracking, users are able to see a calculation of a company's growth rate: the average weekly growth of a company's signals over the trailing eight weeks. PitchBook subscribers can use this analysis to get a breakdown of the fastest-growing companies in any sector. Perhaps the most well-known AR company, Magic Leap is developing a much-anticipated set of AR eyeware that will overlay interactive images and videos onto real-life scenarios. Or, at least, that's the claim put forth by the company's widely circulated marketing video—a piece of material some have argued is more aspirational than it is a real representation of Magic Leap's tech. The company is based in Dania Beach, FL, and has raised about $1.4 billion in total funding from firms including Kleiner, Perkins, Caufield & Byers and Andreessen Horowitz. Headquartered in London, Blippar is the developer of a visual discovery app that utilizes AR and AI to reveal more information about objects users encounter in their daily lives. The company was founded in 2011 and has gone on to raise about $150 million in funding from investors including Qualcomm Ventures. Most recently, Blippar closed a $54 million Series D in March led by Khazanah Nasional Berhad, the strategic investment fund of the Government of Malaysia. Blippar may be in the midst of a rough patch, however, as reports have surfaced that the company is struggling to achieve attractive active user metrics and is burning through its funding at an alarming rate—reportedly to the tune of $3 million per month. Founded in 2009 and already partnered with organizations such as the NBA, FOX Sports and Live Nation, NextVR is developing a VR platform for delivering and enhancing live sports and entertainment. The company has raised roughly $116 million in total funding from firms including Formation 8 and Comcast Ventures, most recently an $80 million Series B in August that valued NextVR at $967 million. A portfolio company of firms including Andreessen Horowitz and Founders Fund, Leap Motion develops technology for VR/AR that tracks the movements of hands and fingers. Founded in 2010, the San Francisco-based startup originally released a device that allowed users to interact with their computers via hand gestures but has since shifted its focus to VR/AR, now offering a suite of hardware and software designed for untethered headsets. 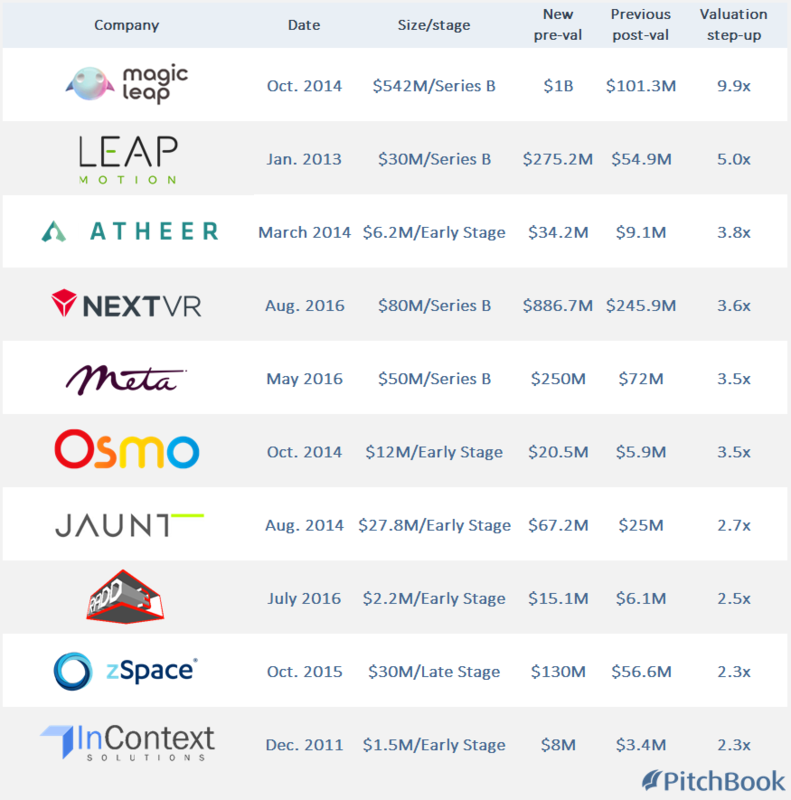 Leap Motion last raised a $30 million Series B in 2013 at a valuation of $306 million. In an event that brought the then-nascent VR/AR space to the forefront of tech conversations, social media giant Facebook acquired Oculus VR in 2014 in a deal worth up to $2.3 billion. Prior to the acquisition, Oculus had launched its headset on Kickstarter, where it raised $2.4 million in funding, about 10x its original goal. 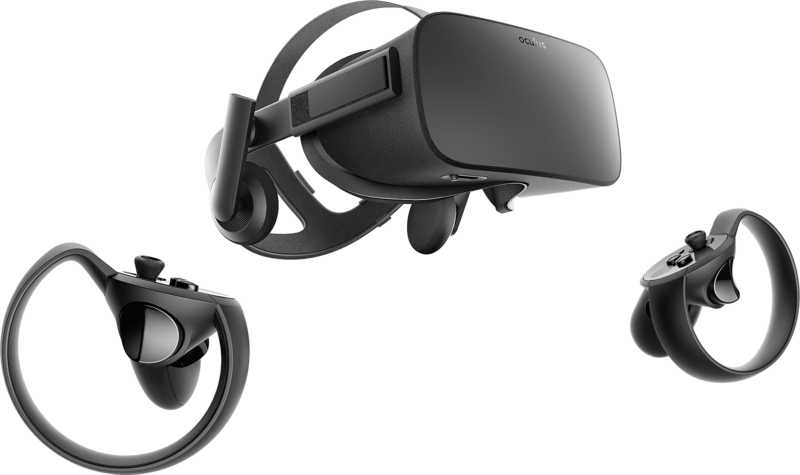 Since the acquisition, Facebook and Oculus have released the Oculus Rift, a VR headset, along with various support devices like hand-held controllers. Oculus has also collaborated with Samsung to develop the company’s Gear VR headset. Before its absorption by Facebook, Oculus had raised about $93 million in funding from firms such as Andreessen Horowitz, Spark Capital and Matrix Partners. A $75 million Series B just seven months before the acquisition valued the VR leader at $287 million. Prior to being acquired by Apple in January 2016, FlyBy Media was a developer of technology that enabled mobile devices to process and map real-world environments. Although the company had primarily offered its tech to an outward-facing consumer audience, it is widely expected that Apple will now apply FlyBy's tech to its own growing VR/AR efforts. Before entering Apple's ownership, FlyBy Media had raised about $22 million in funding from firms including Chart Venture Partners and Robert Bosch Venture Capital. Intel's corporate venture arm, Intel Capital, was already an investor in VOKE before the tech giant acquired the company in November. 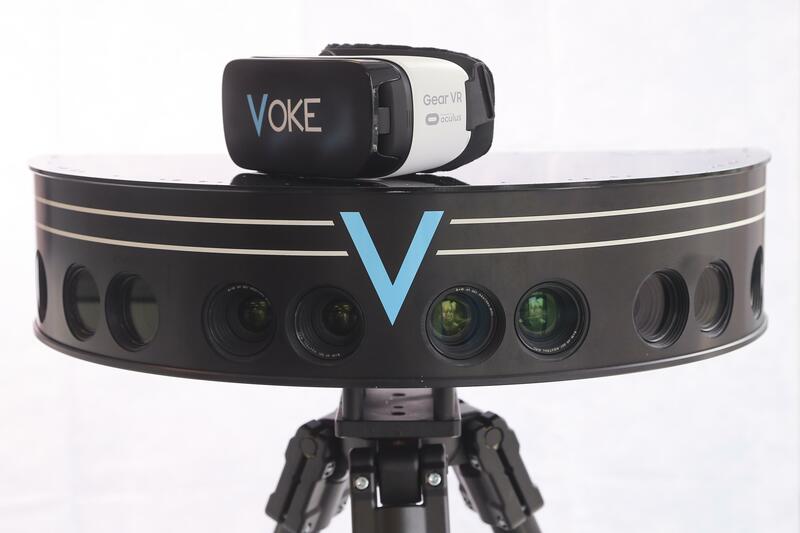 Founded in 2012, VOKE aims to bring the live sports experiences to VR via specially designed cameras that capture and stream live video. Fans can use the company's platform to switch between multiple time-synced vantage points at live events, effectively allowing them to view events from some of the best seats in the house without actually being there. Prior to its takeover, VOKE had raised funding from firms such as F50 and Nautilus Venture Partners; a $12.6 million round in March 2016 valued the company at $21 million. VOKE is now part of a division within Intel that's working on new ways to transmit sports content via VR and multi-camera replays. 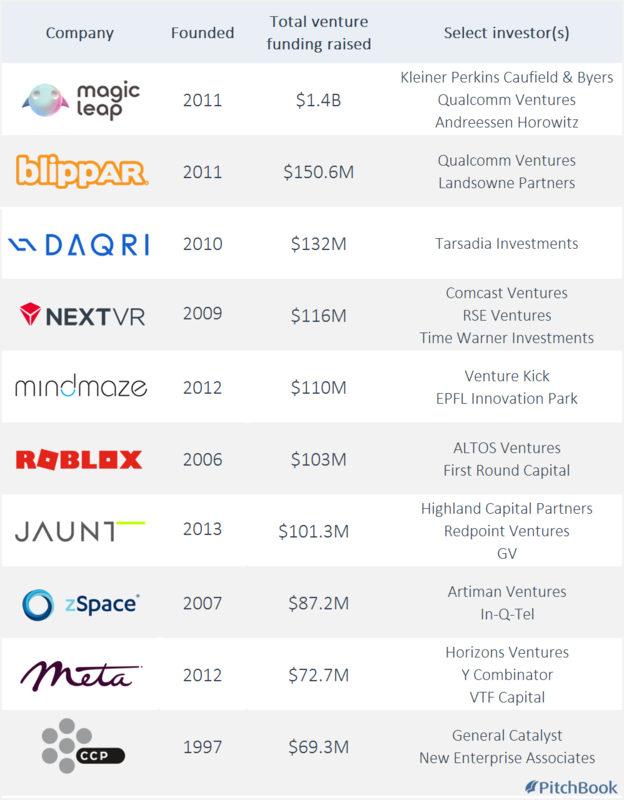 When looking at the most active investors in VR/AR, you'll find a large representation of corporate venture firms, a handful of newer firms and only a couple "classic" VCs. 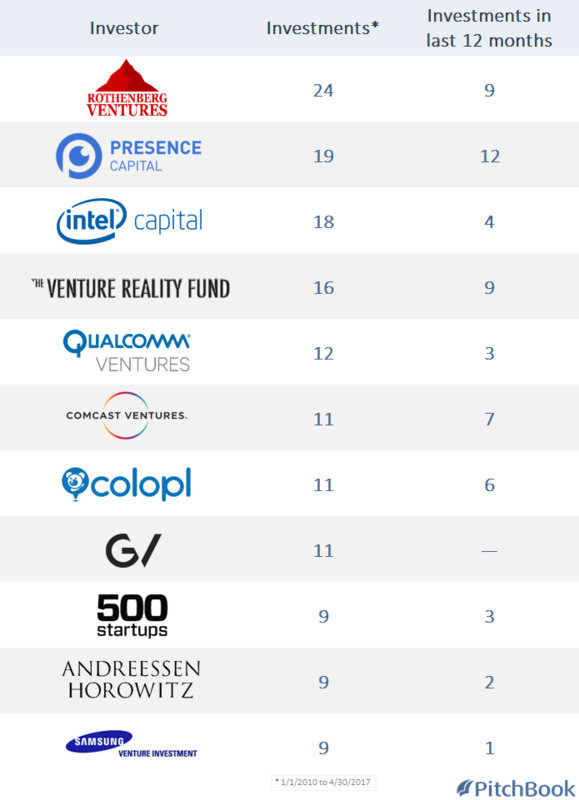 Corporate venture firms make up half of the top 10: Intel Capital, Qualcomm Ventures, GV, Comcast Ventures and Samsung Venture Investment. Outside of the strong CVC representation, it’s interesting to note that there are a handful of newer firms leading the charge, with three of the top four having been founded within the past five years (Rothenberg Ventures, Presence Capital and The Venture Reality Fund). The rapid rate of corporate venture activity is likely not only fueled by the desire to back up-and-coming startups as early as possible in order to maximize profits, but also to give the parent corporations themselves a leg up in potential future acquisition talks. In any emerging industry a big hurdle to development is talent—just look at the scramble that’s been happening for AI or autonomous vehicle experts. Early bets from corporate venture firms sometimes come with a right of first refusal clause, giving them the option to acquire a startup before other potential suitors. With this option, a corporation is not only able to beef up its own offerings but also to keep valuable talent and tech out of its competitors' hands. What type of opportunity is there in the VR/AR space in the next five years? Opinions on the matter range. Some think VR/AR is set to explode in popularity in the near term, while others see the industry as more of a long play. We posed that question to a couple of venture investors to get their take on the potential of the emerging industry. 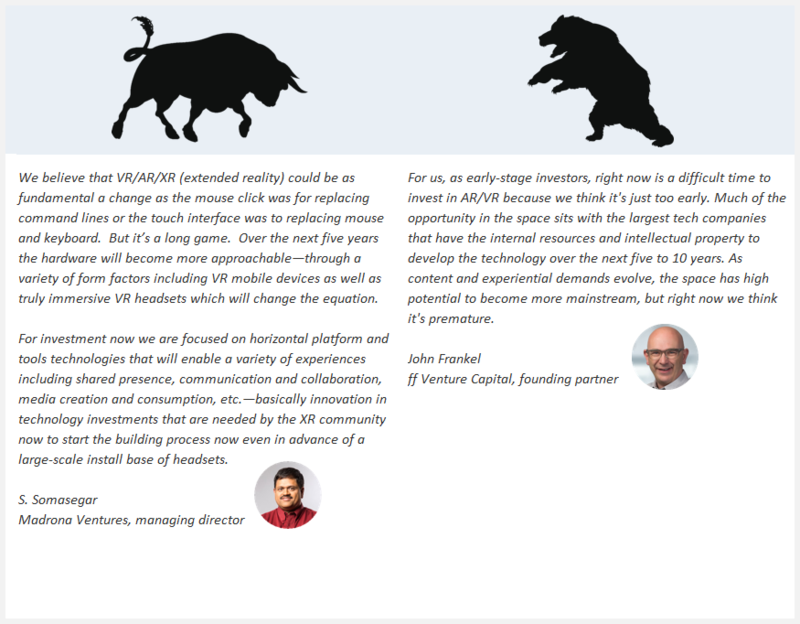 S. Somasegar, a managing director at Seattle-based Madrona Ventures, takes the bullish stance, while John Frankel, founding partner at NYC-based ff Venture Captial, proposes a more bearish outlook. If you liked this article, be sure to check out our IoT Breakdown, which also features VC investment trends, top venture investors, notable companies and more. In a piece of related reading from our archives, check out our VR Analyst Report. Want the latest happenings in the VC and startup industries in you inbox? Subscribe to our daily newsletter, which covers recent financings, fundraises, exit events and more.